A first-edition Harry Potter book was sold for about $19,000, according to an auction house in Dallas, Texas. The soft-cover book was one of 200 copies printed and is a rarity compared with later editions of the popular series that were printed in the millions, the Heritage Auction Galleries said. 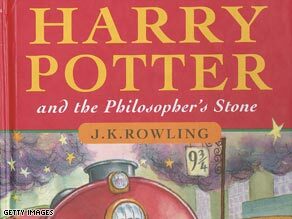 The book, “Harry Potter and the Philosopher’s Stone,” includes an autograph from author J.K. Rowling. It’s the first book in the Harry Potter series and was published in the United States under the title “Harry Potter and the Sorcerer’s Stone.” The auction had estimated that the 223-page book would sell for as much as $12,000. The winning bid of $19,120 bypassed expectations, but it was not the most expensive sale of Harry Potter-related items in an auction. Last year, an 800-word prequel to the blockbuster Harry Potter novel series fetched nearly $50,000 for a writer’s group and dyslexia charity. That prequel was handwritten and signed by Rowling.